Fresh eggs and vegetables from the market make a delicious quiche. Quiche is best served at room temperature so it is perfect to make ahead and take on a picnic. This crustless quiche recipe from The Kitchn is gluten-free and very versatile in using whatever vegetables are on hand. 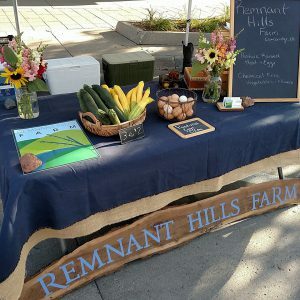 Fresh, farm-raised eggs are available from Raccoon Forks Farm or Remnant Hills Farm at the market, and 11 vendors sell all varieties of vegetables, from broccoli to zucchini.